This brown 'Gracefield' medium multiway bag from Radley features a funky Radley dog accessory to the front, an additional front pocket and two optional handles including a grab handle and an adjustable cross body strap. 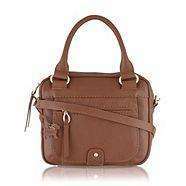 Made of real leather, it is reduced from £159, with the 10% code it works out at £62.60. Good present, or a nice treat. Why so cold? £62.60 for a radley bag seems great? Deal posting newbie! This is r3b3cca first deal post. Help out by leaving a posting tip or just to show your appreciation for their contribution.